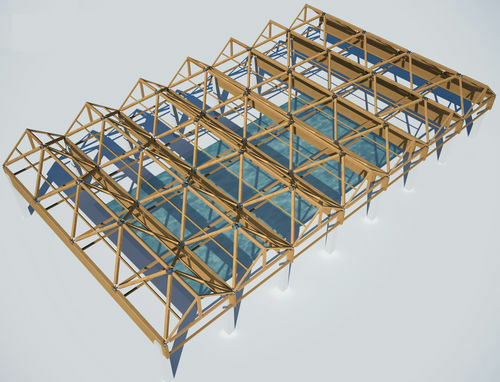 Structures enable completely free span roofing structures to be built without the use of supports, which range from a simple sun shade gazebo with reduced dimensions to the roof of a stadium with a span of more than 250 m.
This unusual product is further enhanced by the fact that, regardless of the architectural design, the wooden parts are always straight and of contained dimensions, particularly in length, enabling them to be effortlessly transported in every part of the world and easily stored and handled during construction work. The great versatility of the patented WOOD SYSTEM enables structures to be built which range from a small gazebo up to roofing structures with spans of more than 250 metres. SPACEWOOD: Structures with straight beams made of laminated wood featuring an exclusive connection system with joints of the spherical radial type (SPATIAL RETICULAR) and/or plate-shaped (SINGLE-LAYER) with steel couplings which are solidly connected to the wooden beams by gluing with two-part resins (International patent). from tensile structures with membrane to rigid panelling made of various materials.